After being rebuffed in its attempt to buy a stake in US carrier and fellow oneworld member, American Airlines Group, national carrier Qatar Airways Q.C.S.C. has bought a 9.61% stake in another fellow oneworld carrier Cathay Pacific Airways Limited. 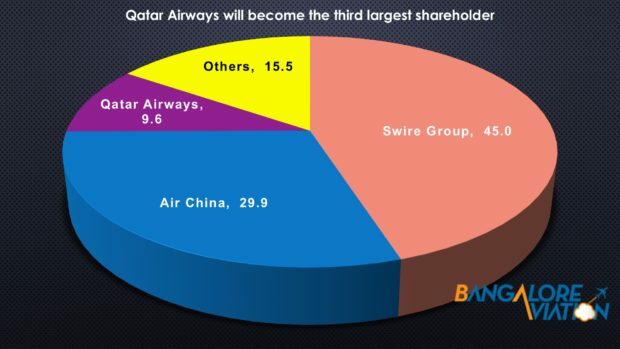 Qatar Airways bought 378,188,000 shares of Cathay Pacific from Kingboard Chemical Holdings and its allied companies for HK$5.2 billion (approximately US$662 million), making it the third largest shareholder in the Hong Kong-based airline. Kingboard had increased its shareholding in Cathay when shares of the airline were depressed due to disappointing financial results. Qatar Airways has been under pressure ever since the island nation was embargoed by Saudi Arabia, the United Arab Emirates, Bahrain, and Egypt. Unlike Abu Dhabi-based Etihad Airways whose risky strategy of investing in airlines in poor financial health and trying to nurse them back, Qatar has been investing in decently healthy airlines across the world. Their shareholdings include a 20% share in International Airlines Group, the parent of oneworld members British Airways and Iberia, a 10% investment in LATAM Airlines Group again of oneworld, and a 49% stake in Meridiana of Italy. Readers might recall the massive $1.7 billion loss Etihad declared after its lost heavily in bankrupt Alitalia and now defunct Air Berlin, a oneworld member. With this investment Qatar gains itself a foothold in to China, a country expected to overtake the United States to become the world’s largest aviation market within the next decade. Chinese airlines have been investment recipients from the global majors. Delta Air Lines has invested in fellow SkyTeam member China Eastern Airlines in 2015, and American Airlines spent $200 million to purchase a stake in China Southern Airlines recently. Cathay Pacific has declared torrid results as a result of competition on both fronts. On the budget side by Chinese carriers, on the premium side, by middle-east carriers. It recently declared one of its worst results for the six months ending June. Many expected shareholder Air China to acquire Cathay and the latter’s shares have risen steadily in the recent past on this expectation. Qatar Airways’ investment dims this prospect, and shares of Cathay dropped 1.5% to reflect this negative outlook. While they may smile for the cameras and speak positives, the Qatar investment is not something the Cathay management is fully appreciating. Will Qatar will be an active partner? 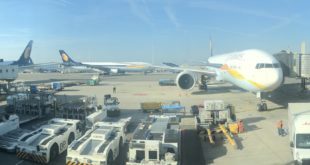 Will it try to channel traffic from both Hong Kong and China via its Doha gateway during the planned transformation of Cathay? Or will Qatar be content to play a passive role and not make any significant moves, at least for the medium term? I suspect the former, but do share your thoughts too, via a comment. Next IndiGo explains the Katyal manhandling incident, admits fault.